Will lower interest rates spur economic growth or distort saving and investing? In 3 Insights from the Real Rates–Real People Curve (June, 2014), the curve suggested it is easier for the Federal Open Market Committee (FOMC) to stabilize the economy than to grow it. This suggests it would be net beneficial for the FOMC to raise rates. Until that day arrives, equity investors will be especially sensitive to taking too much risk relative to return. To help meet risk-return preferences, business model-based investing will continue to be valuable. Looking at the twists and turns of this curve, we listed causes of expansion in real wages and salaries per person. For example, in the past two decades the dot com speculative bubble and the credit bubble temporarily added real wages and salaries per person, only to have them retrench. 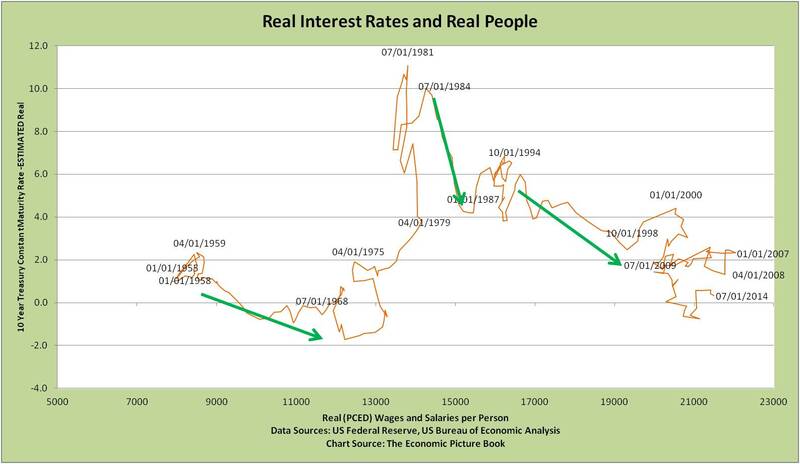 Improving on other measures, the Real Rates-Real People curve relates the real (inflation-adjusted) interest rate on which people make investment decisions to the “pocket book measure” of worker real wages and salaries per person. Thus, it reveals a picture that is clearer than using only nominal (with inflation) interest rates, inflation rates or unemployment rates that have become disconnected from worker wages and salaries. For more, see From Gliding Growth back to Frozen Fifties (May, 2014). Since 3Q2013 real wages and salaries per person have been expanding under stable real rates in an environment of low inflation. Real wages and salaries can expand from either stronger economic activity or lower inflation. Thus, it is important to know the source of price increases and decreases. Nontrivial variations in prices of specific products were discussed in Pig Tales and Price Levels – A Tale of Inflation and You (December, 2014). Restraint in price increases from imports were discussed in World to U.S., Do You “Get” Globalization Yet? (December, 2014). Both imply a gift to real wages and salaries from restrained price increases due to a combination of domestic production cost-cutting and imports. The Real Rates-Real People Curve data is through 3Q2014, the most recent compensation and population data. 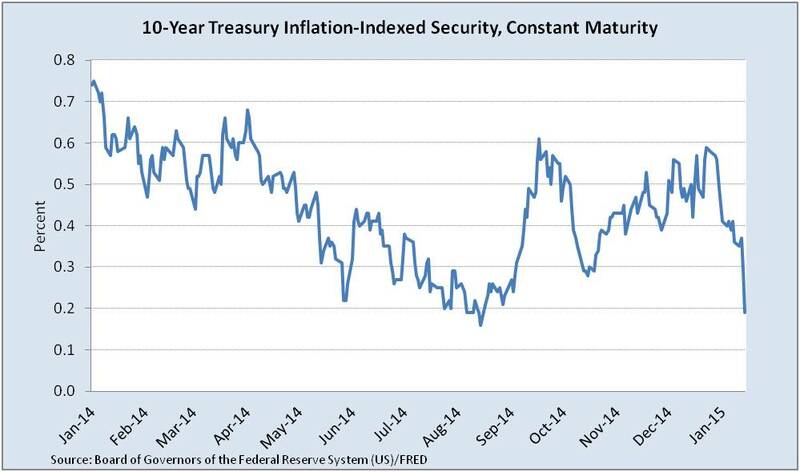 However, the 10 Year constant maturity Treasury Inflation Protected Security (TIPS) is available weekly. This view shows current rates under the influence of low U.S. inflation expectations and global safe asset strength of U.S. Treasuries. In addition, the difference between the 10 and 2 year constant maturity Treasury has fallen from 2.7% in December 2013 to 1.3% today. Facing this situation, guidance for policy makers is as suggested in 3 Insights from the Real Rates–Real People Curve (June, 2014). Data Geek Note: Several versions of the Real Rates-Real People Curve are calculated by ValueBridge Advisors. Each is better at answering a different question. The version above uses Total Population and the Personal Consumption Expenditure Implicit Price Deflator to follow the practice of the U.S. Bureau of Economic Analysis, FOMC preferences and other reasons. TIPS rates are calculated by the U.S. Treasury with CPI for All Urban Consumers. Previous ArticleBig oil big data – do you know these numbers?